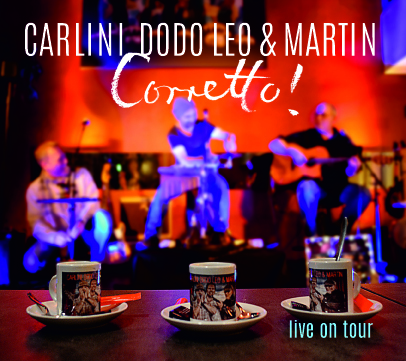 Produced by: Carlini, Dodo Leo & Martin. Marino Carlini: Leadvocals & A-Guitar, Backgroundvocals, Bass, Percussion, Kazoo. Dodo Leo: Leadvocals, Backgroundvocals, E-Guitar, Cajon, Percussion. Thomas Martin: Leadvocals, Backgroundvocals, A-Guitar, Banjo, »Sanifario«, Kazoo. Rapid-Fire-Interview zur Entstehung von Corretto! Linernotes zu den Songs auf Corretto!